Home > Cockroaches > What Is a German Cockroach? German cockroaches are quite different compared to your standard cockroach. This particular species is relatively small, measuring just 1.1 to 1.6 cm (0.43 to 0.63 inches) in length. The German cockroach is very closely related to the Asian cockroach and these two species are often mistaken for one another. The easiest way to tell them apart is through their flying capabilities. The German species cannot fly, although may glide when disturbed. The Asian species on the other hand, can fly similarly to a moth. A German cockroach can be quite troublesome, especially to certain establishments such as restaurants, hotels, and food processing factories. Even though they can exist outdoors in warmer climates, they much prefer to be an indoor species. 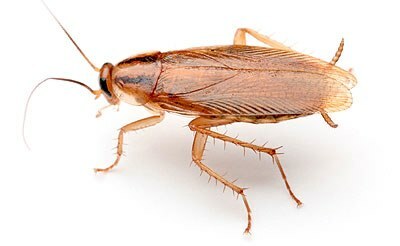 The main reason why these cockroaches are so troublesome is because they can utilize practically anything as a food source, including books, soap, meat, toothpaste, and pet food. Another reason why these cockroaches can be so troublesome is because they are so small, making it easier for them to hide in cracks and crevices. If you have an infestation problem, you might want to try bait stations and other DIY methods. However, it’s more than likely that you’ll need professional help.